When you’re careening towards a frosty death among the stars, hitch a ride with a spacefaring tardigrade! At least, that’s how rebellious teenager Vess does it in Star Pig– the totally radical new comic book from New York Times bestseller Delilah S. Dawson. Illustrated by Francesco Gaston and debuting this July, IDW Publishing’s latest sci-fi masterpiece is filled with nostalgic humor and fiery spirit – just what fans would expect from the writer of Star Wars: Forces of Destiny and Marvel Action: Spider-Man! 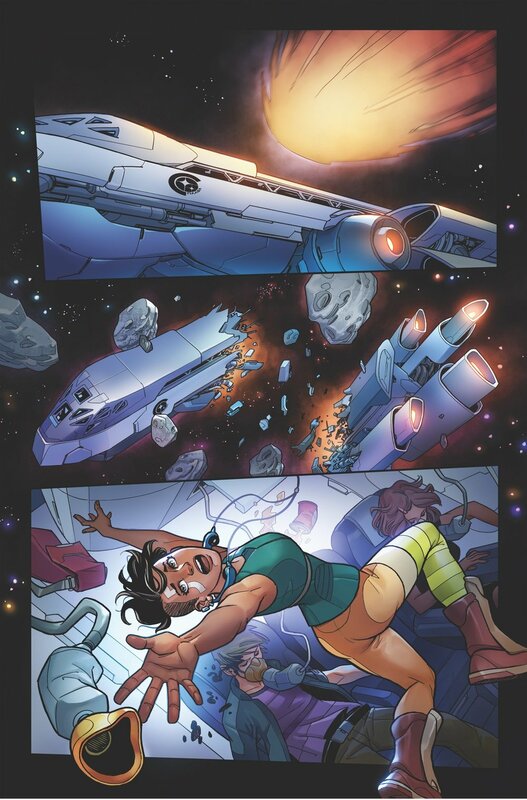 Like many late-21st-century teens, geeky 16-year-old Vess gets packed off to spend her summer at Space Camp — which is literally in space. Tragically, a shuttle accident sends her and the rest of the passengers careening into the vacuum. But when a gigantic, space-faring water bear miraculously rescues Vess and her beloved retro Discman, it’s the beginning of an extraordinary friendship and an incredible journey, all set to the tunes of Vess’s 1990s-heavy playlist. The debut issue of Star Pig will be available with covers by Sara Richard (My Little Pony) and Francesco Gaston (Hulk), with subsequent issue covers featuring the talents of Paulina Ganucheau(Zodiac Starforce), Nicoletta Baldari (Star Wars: Forces of Destiny), and Sara Alfageeh (Star Wars: Women of the Galaxy). Star Pigs will be ON THE SHELF July 2019. Are you a fan of Delilah S. Dawson? Let us know what her favorite work is in the comment section below. Also, Don’t forget to like, share and subscribe to all things Constant Collectible to keep up to date with all the news and reviews from a world of GEEK CULTURE.